“Gorgeous”. “Colourful”. “A real trip down memory lane”. These are just some of the comments from the 7000 people who have visited the Inspiring Beauty exhibition at Weston Gallery in Lakeside this year. As the quotes suggest, it is a gorgeous, glittering exhibition of advertising used by Boots to promote their No7 range of cosmetics, which celebrated its 80th anniversary last year, and has proved to be the most popular exhibition we’ve ever put on. Unfortunately, none of them will apply to this post looking at an earlier period of Boots’ history, focusing on the way the original pharmacy branch of the business was marketed. Marketing was still very basic and was a far cry from the sophisticated, large-scale industry that it is today. 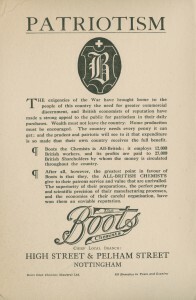 Boots was founded in Goose Gate, Nottingham in 1849 as a chemists by John Boot. In 1877, shortly after son Jesse took over the family business, Jesse paid for the largest advertising space the Nottingham Daily Express offered, an entire full-length column. The advert (Boots the Chemist advert, Nottingham Daily Express, 12 March 1877. Ref: EMSC Periodicals:NOT) ran in several editions and consisted of an exhaustive, alphabetised list of 128 branded products. The list comprises numerous tinctures, tonics, pills and potions that claimed to do everything from ease teething, soothe troublesome coughs and invigorate various internal organs, but the emphasis was on the reduced prices rather than their effectiveness. Profits doubled within a month, proving that newspaper advertising was lucrative, even comparatively dull and lengthy ones by today’s standards. All marketing emphasises the benefits of their products, but during World War I, companies stressed how and why their customers were also helping their country, and turned purchasing into an act of patriotism. 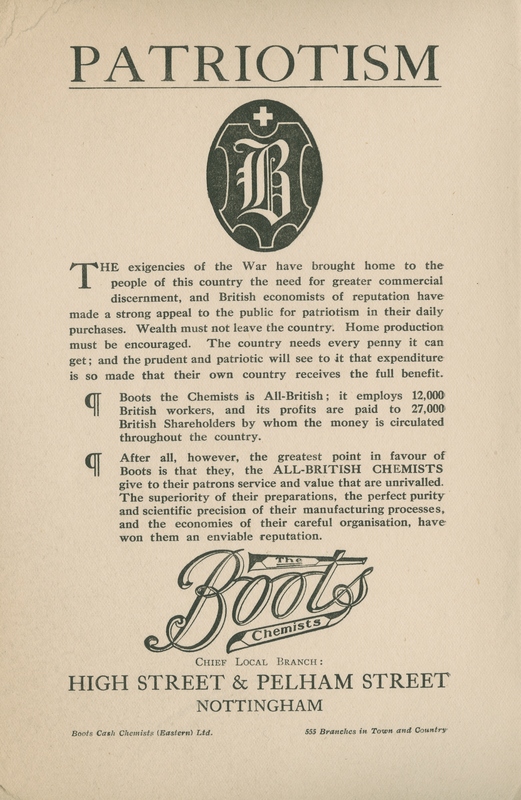 Rather than emphasizing any one product, this first advert is a general promotion of Boots as an ‘all-British’ company and encouraged patriotic consumers to purchase Boots products to support home production. I’m not sure that the germicidal values of Eau de Cologne would have been the main selling point in peacetime, but it’s a lovely example of how advertising adapted for wartime. It would be another two decades before No7 was launched, and although Boots did have a small range of beauty products for women, there were no newspaper adverts for them in Nottingham’s local press. In comparison, there are plenty of adverts for beauty products from WW2, examples of which are in the exhibition. Inspiring Beauty: 80 years of Making Up the Modern Woman runs until the 17th April in the Weston Gallery at Lakeside Arts. Admission is free. To book a ticket for our final lunchtime talk ‘Rejuvenate: Anti-aging in the twentieth century’ by Dr James Stark on 12 April 2016, please contact the Box Office on 0115 846 7777.